The established in the year 2009, We, Dubond Products India Private Limited, are the manufacturing, exporting of the Tile Adhesive, Glass Mosaic Tiles, Wall Texture, Wall Putty, Cement Grout, Epoxy Grout, Swimming Pool Tiles, Epoxy Flooring, Block Fix Adhesive and more. The offered range of products is manufactured by taking quality assured components and innovative manufacturing methods under the supervision of our adroit professionals. 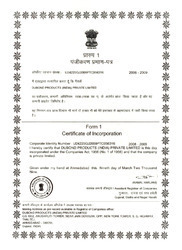 All our products are made as per the industry laid standards and norms. These products are highly appreciated across the market for their premium quality and long shelf life. We export our products all over the world. Our infrastructure is supported by ultra modern facilities for fast processing of the manufacturing of the water ceiling products. We have divided our infrastructure into different units such as manufacturing, packaging warehousing and in- house quality testing units. With the aid of modern machines, we are providing finest quality products that are highly acclaimed among our clientele. We have equipped all the latest machines at our state-of-the-art infrastructural setup, which makes us capable of manufacturing the provided products of best quality within requested timeframe. Further, the equipped machines and technology are regularly upgraded at our infrastructure in line with the ongoing development and trends. 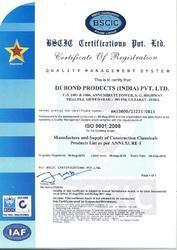 Since our inception in the industry, we are delivering quality approved products to the customers. All our offered products are made from finest quality ingredients to ensure their unmatched quality and longer shelf life. Due to our quality oriented approach, we have earned a huge clientele. In order to maintain our reputation in the industry, we are presenting only optimum quality products to the customers. Further, we are following industry set norms before delivering any promises to the clients. In addition to this, we train our quality controller staff about the advancement of newly launched technologies and methods in order to suit the diverse requirements and needs of our valuable customers and ever-changing market trends and developments. Owing to our sound business policies, capacious infrastructure and competent team of well-qualified professionals; we have been able to cater to the individuals needs efficiently. As a client centric organization, we always keep track and convenience of our respected customers in mind. Dedicated workforce support and wide distribution network, has helped us in presenting the offered product within the promised time frame at the customers’ premises. Convenient payment options are offered to our valuable customers, in a test to attain the optimum level of customer satisfactions and approval. "We are proud to announce the outstanding success of Dubond, Pearl, Sisa, Arclad & Portico on a dynamic platform of Vibrant ceramic 2017. 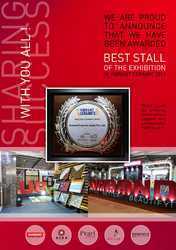 The award for "Best stall of the exhibition" is dedicated to all those who have been an integral part of this achievement. Thank you all for showing tremendous support and unshakeable faith in us !"